Get Them Excited to Go – Every parent has a different strategy to get their child excited about something. 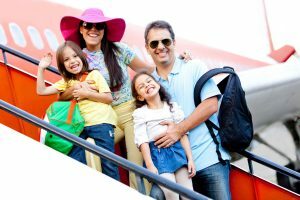 From talking to experienced parents who travel quite often they always stress to involve your child/children in the travel plans. Show them different activities and attractions beforehand and see what interests them. You might be surprised and get to experience something with your family you would have missed out on. 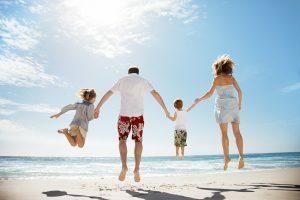 Purchase a Child Locator – I would have to say out of all the things that could go wrong while traveling with children, the one things nobody wants to do is lose track of their whereabouts. This probably goes without saying. My suggestion would be to invest in a child locator. With the rise in traveling families many companies have created apps and should only run you about $25. Bring Cards/Game – When traveling you never know when a plane will get delayed or bad weather might strike. What you can do is be prepared for them with cards or small games. Puzzles, coloring books, gameboys etc.. Nothing is worse than an antsy child during an already inconvenient time. I definitely recommend something educational! Take Advantage of Early Boarding – Most, if not all airlines have early boarding for families. This is a great time to get on the plane before other guests and get situated. Every second counts when traveling with little ones. Keep Hydrated – You would think this goes without saying. Even us parents struggle with drinking enough water. Keeping hydrated is essential when traveling. You need to keep their electrolytes flowing so that they can have enough energy and not get sick. Pack Lite Snacks – Travel requires a lot of energy. If you are constantly on the move trying to see as much as you can in a short period of time, you are going to need a lot of it. Something healthy and nutritious like carrots, hummus packs, nuts & seeds etc.. will do the trick and keep them full until the next meal. Pack Cleaning Supplies – Kids of all ages are universally great at one thing…making a mess. Packing cleaning supplies is a must for traveling with children. If you are not going to invest in a full cleaning kit for your travels, at least pack sanitizer and cleaning wipes. Those should at least prevent too much damage.